After just a few hours yesterday, tickets for the 2018 Coachella Valley Music and Arts Festival were sold out for both Weekend 1 and Weekend 2. The 19th edition of the event will take place April 13th, 14th, and 15th and April 20th, 21st, and 22nd at the Empire Polo Club in Indio. While there are a large number of rap/pop acts, most notably absent are the usual big name rock bands and DJs from this years festival. 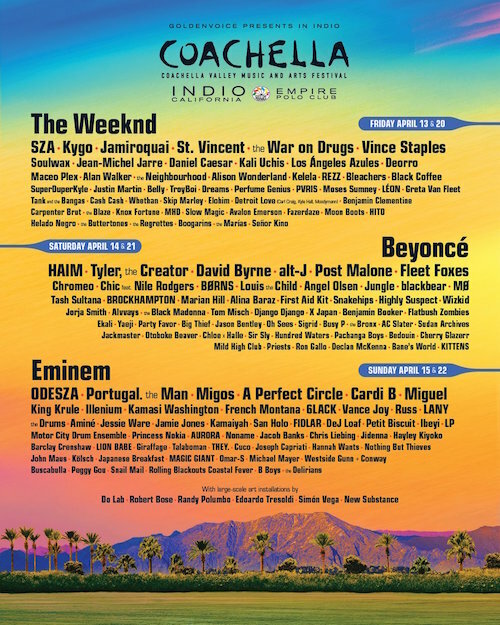 Headliners include The Weeknd, Beyonce, and Eminem, with SZA, St. Vincent, Jamiroquai, Haim, alt-J, Post Malone, Portugal. The Man, Migos, and Miguel on the lineup as well. That being said, there are still a variety of DJs worth checking out over the course of the event. On Friday, April 13th and 20th, Kyogo, Deorro, Maceo Plex, Alan Walker, Alison Wonderland, REZZ, Justin Martin, TroyBoi, Whethan, Slow Magic, Moon Boots will be playing. Saturday, April 14th and 21st will see Chromeo, Louis the Child, Snakehips, Ekali, Party Favor, Jason Bentley, AC Slater, and Kittens perform. Scheduled for Sunday, April 15th and 22nd are ODESZA, Illenium, Jamie Jones, San Holo, Chris Liebing, Giraffage, Joseph Capriatti, and Hannah Wants.